Famitsu has published their interview with Nomura about KINGDOM HEARTS 3 from E3. He discusses the new worlds based on Frozen and Pirates of the Caribbean. A summary of new information can be read below, the full translation will be available shortly. Arendelle will expand on the story from the original film, and "Let it Go" will be featured in some capacity. 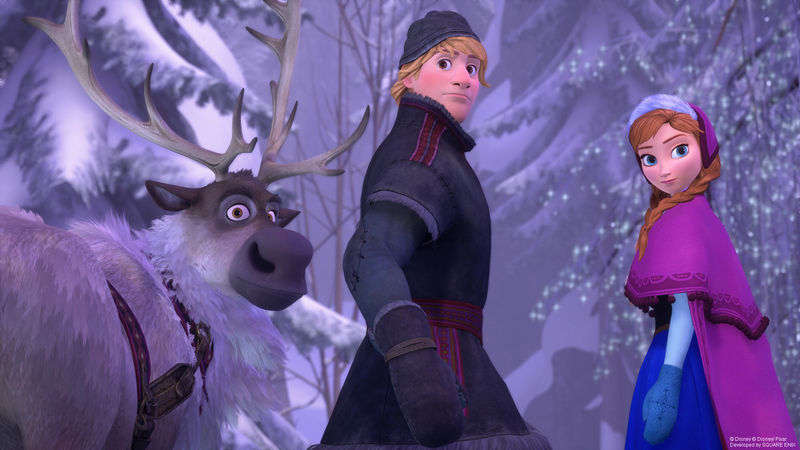 While Anna and Elsa are not party members, Marshmallow, the ice giant created by Elsa, will join Sora in battle. Players will be able to explore the snowy mountains as well as a labyrinth of ice created by Larxene. Pirates of the Caribbean is based on the third film: At World's End. Nomura encourages players to pay attention to the trailers to spot all of the features this world will offer. The Caribbean seamlessly connects land, sea and sky, and battles can take place in all three as seen in the trailer with the naval battle and Heartless battle in the sky. The Black Pearl can be used to navigate the seas and explore newly discovered islands, so there are many opportunities waiting. In the recent trailers, we learned that both Sora and Organization XIII want Roxas to return. For Sora who is connected to Roxas, he is making every effort to make that a reality. Larxene also speaks of the New Seven Hearts, which refers to a new generation of the Seven Princesses. We learned in KH3D that in accordance with Master Xehanort's plan, if the 7 Guardians are unable to gather, the Seven Princesses will be used instead. Of the new Seven Princesses, only Kairi is still included from the original group. Rapunzel, Anna and Elsa are also being targetted as the other six candidates. Like Mobile01 and GNN, Famitsu reports on the summary video that will be released within the month to help new players catch up with the series. They've just finished recording the Japanese version; it will be split into 5 parts, with narration provided by Chirithy. These videos will be released on the official website and they're considering including it in the game as well, so Nomura encourages players to watch the videos, play the HD remasters, and then wait for Kingdom Hearts 3 to release. There are also no plans to release a public demo. However, fans in Japan will have the opportunity to play at the Tokyo Game Show. Nomura apologizes for the delay, but he hopes everyone can wait just a little longer until Kingdom Hearts 3 releases on January 25, 2019 in Japan and January 29 in western territories. Ha, I knew Let it Go would be in KH3. Also like how Marshmallow was the one to be our "party member" instead of Anna, Kristoff, or Olaf. Marshmallow party member! What a cool and unexpected surprise! Gotta wonder if they'll be other worlds with similar amount of features as Caribbean since it was never mentioned as being exclusive for this world, outside navigating the seas. More gameplay diversity per world is more of a plus, even if it uses similar mechanics across the board. Players will be able to explore the snowy mountains as well as a labyrinth of ice created by Larxene. Larxene "It'd serve you right... if I smash this piece of junk!". Iâ€™m probably the only person excited about the prospect of Disney songs being implemented. Iâ€™m hoping itâ€™s just as cutscenes, so we can sit back and just enjoy that element of Disney magic. With the advancements theyâ€™ve made, I donâ€™t think it would be anything like KH2 Atlantica. Iâ€™m less excited about Let It Go and more excited that it might open the door for either Iâ€™ve Got a Dream or I See the Light in Tangled. Iâ€™m really happy that it seems Kairi will be both Princess and Guardian, making her doubly important. I wonder how faithful they will be to At Worldâ€™s End. Itâ€™s probably the least â€œDisneyâ€ Pirates film in my opinion. It has a lot of trippy stuff (like Jackâ€™s hallucinations) and all the protagonists seem to hate each other until the end. I donâ€™t want to say they should water it down, but they should probably streamline it a bit. Especially since we wonâ€™t have the Dead Manâ€™s Chest eventâ€™s to show why Will, Elizabeth, and Jack are pulling guns on each other. It doesn't mean there will be singing involved. true i wonder there there going impelent the part then huh? Marshmallow being the party member is quite the surprise. They've just finished recording the Japanese version; it will total several hours long and be split into 5 parts, with narration provided by Chirithy. what other six candidates is he talking about? with rap, elsa, anna, that leaves four left. also good to know we getting a party member in frozen because the trailer didn't show it. Ugh, I really wanted a public demo. Just to feel the improvements between 0.2 and now would have been... amazing. Arendelle will expand on the story from the original film, and "Let it Go" will be featured in some capacity. While Anna and Elsa are not party members, Marshmallow, the ice giant created by Elsa, will join Sora in battle. Not upset about Anna, Elsa, and Kristoff not being Party Members in the world, since in the trailers Anna & Kristoff weren't in battle with Sora's party and I could see the reason why, when compared to the other party members in the game (Hercules, Woody, Buzz, Mike, Sulley, Jack Sparrow, and especially Rapunzel and Flynn). But combat wise, she doesn't have the fighting capabilities (offense, melee) when battling against a crowd of Heartless compared to the likes of Rapunzel and Flynn Rider from the Kingdom of Corona, the same thing could be said about Kristoff as well. For Elsa, while yes she does user her powers for combat and to defend herself against enemies just like when she saved Sora, Donald and Goofy from the Reindeer Heartless in the trailer and when fighting off the Duke of Wesselton's guards in the film, she doesn't know how to fully control them because as shown in the film a lot of her ice powers were through her emotions. When she's happy, her powers are under control, but when she's upset, scared or under stress her powers will go out of control and will cause harm to others as shown in the film. It won't be until the next game in the saga where Elsa will officially become a party member and join Sora's party as it was shown in the climax that she's able to fully control her powers and was able to lift the curse and bring back summer after realizing that the warm emotion of love is the key to doing so. Quite surprised that Marshmallow is the "Party Member" for the Frozen world and curious to see how he will be in Sora's party. Because in the trailer he was seen chasing after Sora, Donald and Goofy, most likely right after Anna threw the Snowball at him. Whether he would warm up to Sora's party after the boss battle is up in the air since he clearly represents Elsa's desire to be "left alone". Perhaps he will soon get used to them after realizing they're the same three that Elsa meets and would later temporary join Sora, Donald, and Goofy and be the large muscle for the group when fighting of either Larxene or Hans and the guards (including the Duke of Wesselton's guards) when they arrive at Elsa's Castle in the film. Hope to see the other characters in the film like Hans, Pabbie and the Trolls, the Duke of Wesselton and his guards. But given that the story for the Frozen world will follow the plot of the movie through Elsa's eyes instead of Anna's I highly doubt Sora and the gang will meet the Trolls, but we shall see. Also, glad to see that Anna, Elsa, and Rapunzel are confirmed to be the Seven New Princesses of Light, with Kairi being the returning member. So that leaves with only 3 Princesses of Heart left. My interest in the Frozen world is higher now. I really hope Davy Jones is a boss in the Caribbean too. It also doesnâ€™t mean there wonâ€™t be singing involved. Like it or not, Elsa singing Let It Go while she creates her ice castle is one of the most iconic moments of Disney cinematic history and a pivotal moment in Elsaâ€™s character development. If theyâ€™re trying to be as true to the source material as possible, itâ€™s likely that they want to implement that. To show it any other way would likely fail to do the moment justice. In musical theatre, we say that songs are best used in moments where the characterâ€™s emotions are too strong to be conveyed through dialogue, which is absolutely the case at this moment of the film. Seeing what theyâ€™ve done with replicating scenes from Tangled and Pirates nearly shot-by-shot from the movie, I strongly suspect Let It Go will be happening as a musical sequence. Iâ€™m not worried as I donâ€™t see them turning it into a minigame or anything like that. I hope it will be Nomura showing off what the new graphics engine can do with the castle and Elsaâ€™s dress while we sit back and enjoy it. Lol. She could have just commanded the ice Heartless to create it maybe? I really thought this game would break the cycle of literally only having 1 female party member in a sea of dudes and now it isn't looking so likely...in fact its worse since many worlds are doubling up on the bros lol. *sigh* I am not happy about this decision tbh. But its not like it'll change. I don't even know if he is saying Marshmallow is a full party member? Like maybe just a guest which is also just...meh. I'm glad I am dissapointed now so I can get over it sooner lol. I guess its also nice to have confirmation on the new 7 hearts but I dunno if I like that either lol. It seems super convenient that only Kairi remains as a member. I would assume why its shifting is gonna be addressed. This also sorta increases the chance of not seeing any of the old princess' worlds. I guess I was looking forward to seeing them all gathered up even without their worlds again. But combat wise, she doesn't have the fighting capabilities (offense, melee) when battling against a crowd of Heartless compared to the likes of Rapunzel and Flynn Rider from the Kingdom of Corona, the same thing could be said about Kristoff as well. For Elsa, while yes she does user her powers for combat and to defend herself against enemies just like when she saved Sora, Donald and Goofy from the Reindeer Heartless in the trailer and when fighting off the Duke of Wesselton's guards in the film, she doesn't know how to fully control them because as shown in the film a lot of her ice powers were through her emotions. When she's happy, her powers are under control, but when she's upset, scared or under stress her powers go out of control and will cause harm to others as shown in the film. It won't be until the next game in the saga where Elsa will officially become a party member and join Sora's party as it was shown in the climax that she's able to fully control her powers and was able to lift the curse and bring back summer. Curious to see how Marshmallow will be Sora's party, cause in the trailer he was seen chasing after Sora, Donald and Goofy, most likely right after Anna threw the Snowball at him. Whether he would warm up to Sora's party after the battle is up in the air since he clearly represents Elsa's desire to be "left alone". Perhaps he will temporarily join him in and be the large muscle when fighting of either Larxene or Hans and the guards (including the Duke of Wesselton's guards) when they arrive at Elsa's Castle in the film. I mean, if they are progressing the story past the main plot then Elsa being a party member makes sense still. She has had much better control in all the shorts. Like idk, I have a feeling they also didn't make her a party member for this sorta reason but I don't agree with it. If Jack Skellington can like summon flaming pumpkins, Elsa can control her powers a bit more. I agree that we need more female allies. Perhaps, Elizabeth Swann will be a party member in Pirates? She becomes the Pirate Queen in that film, so it would be appropriate for her to fight alongside Sora as well. Iâ€™m hoping for Kairi, of course, and maybe Honey Lemon or Go-Go. If Atlantis appears, Kida would be a great party member. This is the sort of reason I have been wondering if Kairi will even be considered a guardian tbh. I would be happy if she could be both, but I am unsure if that is what they will do. She actually becomes King lol, but yea I was thinking she could be one as well but I won't hold my breath. I kinda get the impression they are showing off all the party members when they reveal the worlds now that we know Elsa and Anna are not members. I have had hopes about Honey or Go Go as well, but I have a bad feeling they will just make Hiro the second party member even though he has no combat abilities in the movie. Which will also make all the points about Anna not being able to be a party member cuz all she does is punch stuff sorta go out the window lol. But I digress.... I recall last year Nomura saying there may be a worlds with more than 4 party members? Big Hero 6 is the obvious choice if thats really true. This is the main reason I was hoping to see both Anna and Elsa as party members; it's a shame that only 1/8 confirmed party members are female, and even with summons we're at 1/3 (1/4 if you include dream eaters?) females so that's probably not looking too good either. Anna has no fighting skills and Elsa spends from what I know, trying to stay away from anyone, would not be fighting agsint the heartless for the sake of it. Rapunzel is traveling to see the Lanterns with Flynn somewhat guiding her and also wanted. I sure hope that Elizabeth Swann in The Caribbean world gets her moment to shine cause she has been shown to become very good at Sword Fighting/Fencing. And Honey Lemon and Go Go Tomago will also be awesome members in your party when fighting against Heartless, since Honey Lemon uses her Purse to purse capable of creating various weapons in the form of palm-sized "chem-balls" through the use of the aforementioned periodic elements. For Go Go her discs are very good weapons that are capable of causing quite a lot of damage once flung to a specific target. Once the target is hit (if at all) the discs magnetically return to the suit, enabling instant reuse. Here's to hope they won't get the short end of the stick and be sidelined as NPC's cause we need more female characters from Disney films in Sora's Party. I agree it's awesome to hear the actual music from the films be heard in the games, don't forget Winnie the Pooh's theme song along with Bibbidi Bobbidi Boo from Birth By Sleep, and recently You've Got a Friend in Me from the Toy Story world in III are also featured. Whether Let it Go will actually be sung by Elsa in the vein of Ariel singing Part of Your World or Under The Sea, in Atlantica from II, or as a brief theme melody like Beauty and the Beast that was heard in the ending of the Second Vist to Beast's castle, remains to be seen. I already addressed the first point as Jack Skellington also has no fighting skills at all. And the whole Elsa thing, if this goes beyond the movie then she should also be beyond that point but yes, that reason makes more sense if they are trying to stay in character. But real talk, they could just...edit the story more. I really hope this does have more to it than just Frozen's plot, just as I hope the same for Pirates and Tangled. It sorta matters when they leave out literal magic wielding females from an RPG party lol. You're implying they shouldn't just throw in a woman to have one, yet all the ones we have been mentioning in this thread have actual combat abilities anyway. And are all important characters in their films at that. Its not like we are saying Alice should have been a party member or something. Hmmm I'm kinda worried about Arendelle now, does Nomura mean we will see ONLY snowy mountains and an ice labyrinth? I really hope we get to see some interior designs in this world, I was kinda expecting the kingdom castle to have small segments open inside, and maybe that's not what's gonna happen? So at least hoping Elsa's ice castle has something more elaborate inside it cause plains and mountains are really boring map design, specially considering the other worlds we have seen so far. Anyway, I'm probably worried over nothing, the content we're seeing in this game is insane, there's no way they would make such a hyped world so bland. Neither Jack Skellington nor Ariel have combat abilities in their movies from what I can remember, so I really doubt they base who should be a party member on that. edit: also yeah, one thing I dislike about KH1 and 2 is how 99% of the female characters are just there to be damsels in distress. It would be nice to have more female party members besides Rapunzel. I really hope the Purple haired girl from BH6 is a party member. She looks like she'd have a unique skill set. From the way the translation was phrased, Marshmallow is not going to be a full party member and will rather play more of an "assisting" role, like Hercules in KH2. Marshmallow is gonna be a summon I imagine. New PoH hopefully means new stations of awakening. Maybe that will be part of a tutorial. And also like Timeless River Pete when he assisted Sora's party in fighting against Future Pete. I agree, Go Go's move sets are awesome especially the way she uses her discs in combat, also her hair isn't entirely purple its black but she has violet streaks in her hair. Also this confirms thereâ€™s still 2 worlds to go not including 109 acre wood. New princess s of heart. Tiana has got to be one of them and I think Merida or Shanti from the jungle book is thenther or maid Marian from Robin Hood. You and me both, I sure hope Nomura doesn't pull a CLU on Davy Jones and he's not fought as a boss. Let it Go could just be a battle theme or something. It was never not gonna be included. I'm slightly dissapointed about there being no public demo, and slightly worried about Chirithy explaining the entire plot for several hours. I hope the 5 parts are released simultaneously. Let it Go could just be a battle theme or something. I don't think so, the music that was playing during the first half of the Frozen Trailer and the Square Enix Showcase trailer was the battle music for the Frozen world. Elsa not being a party member makes sense from a narrative standpoint. She's the source of conflict in the movie. Also, wouldn't it be more ideal for her to be the Shiva summon of the game instead? It's not impossible to have more than one field or battle theme - especially during a boss or othe big moment. But I do think it may be in a scene instead, too. I want Hiro's Aunt to be a princess. I can't see how Merida is made of pure light. She was rude to her staff, didn't take responsibility for her actions and blamed it on her subjects. How that is considered more of light than dark I can't see. She's filled with more darkness than light. Lilo is a fun case. She's different and odd from her peers, but once she gets to know someone she's really sweet and loyal. It's a shame though that Japan isn't a fan of her character. Too bad that Elizabeth can't be considered. I almost heard motifs of Let it Go during the music in the trailers. I don't know that I like that they're changing the Princesses of Heart. So are Cinderella, Aurora, etc. no longer PoH's? Or, are they just making new ones? It's like giving everyone a Keyblade all over again. Ok so I'm actually ok with Frozen as a world, but I really don't want to sit through another rendition of Let It Go in this game by Idina. Guess I'll haft mute the game when it happens. I think they are just making new ones. Kairi didn't lose her princess status. I think you can just chalk it up with Nomura's obsession with the number 13 again, lol. I wonder if Marshmallow will assist like Beast. I'm assuming mostly physical attacks. Agreed. I hope it isn't all narration. Hopefully some scenes cut out from previous games will be used. True, but the music that played in the first half had a more whimsical/mysterious excitement that is very close to a battle theme music for a world, so more than likely its the battlefield theme for the Frozen world. The same could be said about the Hunchback field/battle music that played during the Jump Festa 2012 trailers of Dream Drop Distance. The melody has a whimsical/mysterious excitement within the trailer so I doubt that's Let It Go, it could be the battle/field music for the Frozen world. This is is just speculation, but it might be because the originals became to self aware of their PoH status? They did all use their light in KH 1 to keep the darkness from spreading from the keyhole in HB. Kairi may not count because she was unconscious for most of that/in Traverse Town. These lights are incase Sora and co. canâ€™t get their guardians together, so Xehanort might be looking for an easy, not going to fight back, back up. Hmm.. Bit disappointed that there won't be a public demo, I would have liked the chance to play the demos at least once before release as I was not able to attend E3 and probably won't be able to go to TGS or Jump Festa. Ah well, guess we'll just have to wait for the full version. Chirithy narrating? Really? When you have actors like Mark Hamill, Keith David (kinda), Corey Burton, and the rest available? Yikes. Even Haley in his normal speaking voice would be better. Are the 5 parts releasing simultaneously or weekly? Also I hope this is included in the full game. It would definitely help the Xbox audience get up to speed. I'm really hoping Tiana is one of the other princesses. I have a feeling that both Anna and Elsa won't be a pure heart. Maybe Elsa is being targeted and it's revealed it's actually Anna who is pure. For the other others, Maybe Pocahontas will finally show up. And I'd love Moana to make an appearance, too! I can see Vanellope showing up and Ralph joining as a summon to save her...though I'd take someone else over her. Smh @ y'all hating on Chirithy. I think Chirithy's voice is cute just like the rest of Chirithy. Oh god. That sounds unbearable. Never been happier to not be a newcomer to the series. Wouldn't Yen Sid or Jiminy Cricket be the more suitable narrator for the series? Yeah, I'm gonna be honest here. I don't think I'll be able to handle several hours of Chirithy narration. The voice is cute, but several hours of it will kinda get annoying. Like out of all the characters, they pick Chirithy. Wouldn't it make more sense to have Yen Sid narrating? Or maybe the Master of Masters? The guy who basically wrote down the entire story into a book six times over? Jiminy? Eraqus? Sora? KEITH DAVID? They got Keith for the Square showcase, they can get him for this. Pirates of the Carribean still makes me go ugh... least it's more action pased it seems, but still... the one Disney movie I literally slept through. Curious as to why they're pursuing seven new hearts instead of the old ones. Chirithy makes sense for the X-era parts of the story, but not for the present era BBS up to KH III. For the present era, Yen Sid, Jiminy Cricket, Mickey, Merlin or even Ansem the Wise would be more suitable. I doubt Tiana and Namine will be one. I think Boo and Elizabeth Swann. I think the 7 new princesses are. Why do you doubt Tiana? Along with Anna, Elsa, and Rapunzel, sheâ€™s one of the primary Princesses in Disney Parks and merchandise. Sheâ€™s a true princess and just as pure as the others. She certainly makes more sense than Boo or Elizabeth. Boo is a toddler and canâ€™t fully communicate. Itâ€™d be kind of messed up for them to depict toddler kidnapping when there are other options of Princesses who can hold their own. Alice was young, but she was still mature enough to speak for herself. As for Elizabeth, she more or less murdered Jack. I love her, but she isnâ€™t pure of heart. To paint her as such would betray her character. Also, you notice you said I was probably wrong about Namine and then suggested her in your double post, right? Also, Nomura confirmed Kairi is still one of the seven pure hearts, so she should be on the list regardless. How do you think Tiana would appear though? I think that it'd be a good world and the villain from the film is great but I don't see how they'd add the world to the game, who would be the party members? Also is the Princess and the Frog well known in Japan? That could lower the chances of it appearing in the game. Elizabeth Swann, eh? I doubt it Luxord said he was looking for MOM's box and the organization isn't exactly hiding the fact that they are after the princesses of heart. Agreed. Honestly, when Chirithy would narrate in Chi Back Cover, I got this very weird Care Bears vibe from his/her/its voice. I don't know if I can withstand hours of Care Bears narration. Yen Sid would get monotonous over time, but at least he'd sound cool. Jiminy would probably be the most appropriate overall, as he's been the chronicler of the series from the beginning. And since this is merely a summary of lore, it doesn't matter whether the actual character in-game actually knows the events, so I'd be cool with Jiminy narrating Chi as well. Any 'princesses'. Maybe the new 7 hearts aren't even girls or princesses? Surely it made sense in KH1 but now, looking at all the worlds we have, I don't think this will be the case anymore. Not sure how the film did in Japan, but popularity really doesn't matter, what matters is how well the plot would meld with KH's overall plot, which this film does really well. Besides, the film helped Disney gain their momentum back, that alone should give it some recognition. Party member wise, it doesn't really need party members, not all Disney worlds will have them (Frozen is looking like one that won't have any). Well I think there's still a good point looking at what's hot and popular in Japan. Obviously Frozen is, Monsters Inc is huge in merchandise from what I believe. Finding Nemo is the 22nd biggest animated film in Japan according to box office results. And Finding Dory was marketed crazily in Japan back in 2016. It even got it's own attraction in Disneyland Japan. I SO hope this happens!! Since we didn't actually visit all the princesses' in KH1's worlds, perhaps Ariel still has a chance of appearing as one of the new princesses even if Atlantica does not. (Ulterior motive: I really just want an official station of awakening for Ariel to match the gorgeous ones from KH1.....) I'm glad Elsa, Rapunzel, Anna will all be a part of the new group. Tiana better be, too. Perhaps they could have one station with both Elsa and Anna featured together. Although... Wait, we only saw stations for the princesses whose worlds were destroyed in KH1. Ah, who cares, they rarely follow their own rules anymore. I care more about new art than precedents they've already blasted to smithereens regularly. Good point. I was wondering why they would include Kairi again and not switch her out for Namine (as a flipside version of Kairi just like this is a flipside version of the PoH). That explains it. THIS. It's not like anyone is asking for Boo from Monsters Inc or Bo Peep from Toy Story to be party members. Anna and Elsa on the other hand are main characters that would work just fine as party members. I didn't really expect Elsa to be one in KH3 since they're following the plot of the first movie when she's mostly off on her own (I imagine she will be a party member in future games though; I expected her to be treated sort of like Hercules, who only just now gets to be a party member), but there's no excuse for Anna and Kristoff to be ignored. Don't get me wrong, I like that Marshmallow will be present in battles (sometimes? all the time? ), that's cool. Still, that doesn't make up for the lack of a good party member for this world. As far as "Let It Go" and the labyrinth created by Larxene... I imagine "Let It Go" will be background music only, either the world's non-fighting theme or used for a brief moment like the B&tB music at the end of Beast's Castle in KH2. As far as the labyrinth, it's possible Larxene used her lightning and daggers to slash a labyrinth out of an ice block/glacier/lol iced over cave, whatever, insert-plot-here. This actually ruins the motif; 6 Princesses + 6 GoL + Kairi who is both = 13 Lights. If we're retaining the old princesses as well as new ones, we have 6 OG Princesses + 6 Neo Pure Hearts + 6 GoL + Kairi who is all = 19, which rates A Meaningless Effort in my book of KH number symbolism. There was no need for new Princesses; it shifts the lore of the KH series horizontally by doing a palette swap on an existent plot mechanic, providing the illusion of story development without altering the status quo; it (likely) robs us of the opportunity to examine the powers and purpose of the original PoH in any serious way, whom we've barely had the opportunity to so much as consider as characters; and it enhances this toxic notion pervasive in KH that women are defined by their purity and their vulnerability, or at least that those qualities tend more often than not to define women. At this point in the series Nomura does not need to be rebooting sexist tropes, especially not when the first game was at least inadvertently susceptible to deconstructing them in interesting if roundabout ways. 1) Make it about kids. The fairytale about the destruction and reconstruction of the worlds mentions that the light within children was responsible for piecing everything back together, making it a logical movement for Xehanort to at least investigate the veracity of this bit of folklore if he himself is aiming to reconstruct the world. On a meta level, it slots in with a similar motif to that of the Princesses of Heart, which aimed to give famous Disney heroines plot relevance; the same could be done with the plethora of famous young Disney protagonists such as Andy, Boo, Hiro, Lilo and Christopher Robin who become representative of the children from the fairytale. 2) Make it about darkness. Invert the scenario; rather than rehashing the princess of light plot for no reason, Xehanort ought to be seeking out candidates for pure darkness. His stated motive is to create a world that represents balance between light and darkness, so why would he want to find or, worse, create seven new pillars of pure light to form his new world? 7 of those already exist, so what Xehanort should really be seeking is a series of candidates who are strong enough to act as vessels for total darkness and counter the light of the 7 Princesses. This would work because, in the first place, he already has one: Vanitas, who would then act as the thematic foil to Kairi being that he is both a Seeker and a Pure Darkness. It would also clarify and strengthen Larxene's role in Arendelle and recenter Elsa in a way that makes actual sense: if you're trying to sniff out and enhance the light in someone, Larxene is one of the last people I would send for reasons that should be obvious-- but if your goal is to snipe at their insecurities, inflict psychological torture and drive them towards the darkness, Larxene is perfect for that. This has the added benefit of causing the story to acknowledge feminine characters as layered, complex and differentiated from others in their moments of internal crisis, rather than stalwart Forces for Universal Good who exist simply to condone the actions of the real agents of change, who happen to be predominantly male-identified. I mean, now that Aqua is apparently out of the running (which, ugh), Kairi is the only female GoL, and a significant portion of the fanbase will be complaining about how unrealistically overpowered she is because the series neglected her for a decade; so what we definitely needed at this time was another round of How to Get Away with Victimizing Women. Unfortunately Nomura has already made clear that the new seven pure hearts will again be all female. Well, he said they aren't necessarily princesses now, just girls. Anna Elsa and Rapunzel are Disney, not Pixar, so did you mean 2 Pixar IP? and the original one COULD be Olette (I mentioned in another thread) because I personally think she's cute. That would be interesting, I just mentioned in another thread about 13 darknesses seeing those UX characters. The Pixar/Disney argument I figured was still relevant because they are owned by Disney but future Pixar films still utilize the Pixar logo, so I thought we'd consider them separate for KH3 because this is the first time anything from Pixar has been featured in KH. I'm not sure if this will matter to you, or if you've noticed it but the links use the Dive to the Heart stained glass motif on their command menus and Ariel's no exception. It's not quite what you're asking for, but it's something. Atlantis is going to be in the game and Kida is going to be a light. I've just re-watched the film and it fits to perfectly to not be included in the game. So i saw this posted by kh quotes and i just was curious to see what everyone thought. At first glance, it wouldn't be hard to believe that this could be related to an Atlantis gummi section. You got robotic serpent that looks like it could possibly be connected to the Leviathan, moving in what seems to look like underwater? It just looks pretty fitting but i don't know. Just thought it would be nice to bring up. Like, on one hand I'm disappointed there'll be no public demo because E3 was packed and getting through both demos meant you had to really rush through it and miss a lot, but on the other hand I wouldn't like 95% of potential KH3 buyers basing their first impression of KH3 off of a 7-9 month old build of the game. Keeping it contained to events is good enough if they properly prepare for the crowds this game will draw. Hopefully they will learn from the nightmare of E3 and help to get people through to play the demo. They really shouldn't have left in the 7 minute cutscene at the start of Toy Box. It really should have been free exploration of Galaxy Toys rather than 20 minutes they give you to get through both Olympus & Toy Box (impossible to do unless you skip cutscenes and hurry on over to Galaxy Toys). I'm very curious about the summary video. I think people should be curious and almost afraid of how accessible it is. It will either fuel the 'convoluted plot' fire or actually serve as a great introductory summary to the series. I do wish people would just play the games - it's confusing but a million times less confusing if you do play the games! - but this is better than nothing. I'm surprised that there's no word on the English version of this. Since it's Chirithy doing voice over and the KH scenes are all done, I have no idea why they weren't done in conjunction with each other. I wish we knew that Kairi would still be considered a Princess of Heart before the Easy Allies discussion. That would have helped lol. Very curious about the last three princesses. I'm praying for Tiana and Kida. sounds like this game is massive. So we at getting a secret movie then. Hopefully we get a glimpse of the next big bad. I really hope the secret movie is just something nice and not a tease for the future.